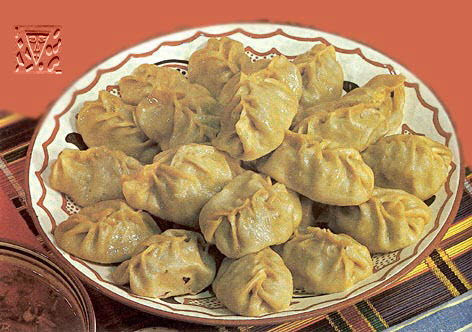 Manti are a type of dumpling in Turkish. Manti were carried across Central Asia to Anatolia by migrating Turks in the Chingizid-Timurid periods. According to Holly Chase, "Turkic and Mongol horsemen on the move are supposed to have carried frozen or dried manti, which could be quickly boiled over a camp-fire". In Turkey it is also called Tatar bureks. Mutton and onion are finely chopped, mix carefully, refuel salt and pepper. From unleavened dough roll small cakes, on the middle of which lay stuffing and piece fat of sheep's tail; the edges of small cakes nip, giving a round form to the wares. Manti boil on a pair give, inundating meat-stock and sour milk, sprinkling with a pepper and greenery. Mutton 35, fat of sheep's tail 7, onions 35, flour wheaten 40, water 20, milk sour 20, pepper, greenery, salt.